Dr. Adam B. Clemons is a seventh-generation Alabamian and third-generation educator who was born and raised in Madison County, Alabama. He graduated from Buckhorn High School in New Market, Alabama. He earned an undergraduate degree from Auburn University, a M.Ed. from Jacksonville State University, and an Ed.S. and Ed.D. from Argosy/Sarasota University. While attending Auburn University, Dr. Clemons started ABC Design, a business specializing in political consulting and digital marketing. From its creation until its closing upon Dr. Clemons becoming a principal, he worked with politicians, political organizations, and businesses at the federal, state, and local levels. In addition to running a business, Dr. Clemons began teaching social studies in 2001 in Adairsville, Georgia. 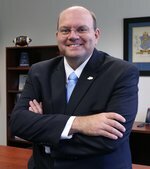 In 2008, he became a middle school administrator in Armuchee, Georgia. Since 2013, he has been the principal of Piedmont High School in Piedmont, Alabama. Dr. Clemons has presented at conferences or events for the National Association of Secondary School Principals, Education Week, Apple, Inc., Council for Leaders in Alabama Schools, Alabama Department of Education, Jacksonville State University CORE, Professional Association of Georgia Educators, and other institutions for educational or political purposes. Dr. Clemons has written articles for and been be published by the Association for Supervision and Curriculum Development, Council for Leaders in Alabama Schools, Hometown Headlines, and The Auburn Plainsman. Dr. Clemons serves as President of the Calhoun County Principals and Coaches Association. He also serves on the Executive Board of Auburn Christian Fellowship at Auburn University. Dr. Clemons is married to a speech-language pathologist. They have five children. They are members of the First Baptist Church of Piedmont. Hunting, genealogy, visiting historical sites, and reading historical biographies, are the favorite hobbies of Dr. Clemons.